At Cartridge Care Bury, we deal with every major brand of printer cartridge – in most cases we can refill your existing cartridge saving you approximately 50% on the cost of the cartridge and we’re so confident your Cartridge Care printer cartridges will be as good as the original manufacturers’ that we offer a 100% money back guarantee if you aren’t completely satisfied. Refilled Toner cartridges Bury. 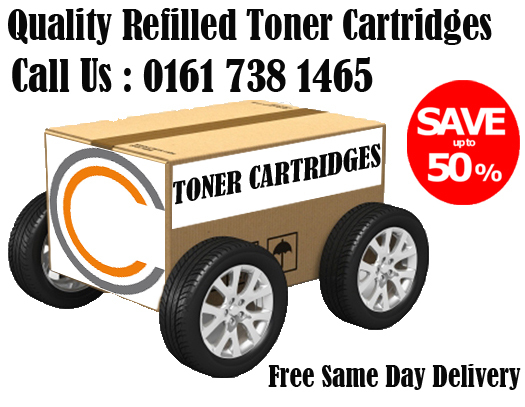 We can deliver your printer cartridges, toner cartridges, ink cartridges, compatible cartridges in Manchester – Free delivery to businesses and households In Salford, Bolton, Stockport, Manchester, Radcliffe, Tottington, Ainsworth, Prestwich, Cheetham Hill, Trafford Park, Whitefield, Bury, Heywood, Oldham, Audenshaw.